Defining characteristics: Orange color, ridges on underside of cap that look like gills but are not, growing in spread out groups but NOT a single large cluster, odor (from none to apricot-like). I have now been hunting New England mushrooms for 1 year. 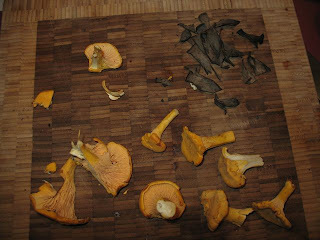 I have been hoping to find the chanterelle, and finally this last weekend I had success! While visiting family in Maine and we took a hike along an old dirt road that proved to be full of fun mushrooms. I will try and get to some of the other species in a later post, but for now- the chanterelle. Chanterelles are one of the most sought after and popular wild mushrooms (you can read all sorts of neat things about them at wikipedia, from mushroomexpert.com, and mykoweb). They have resisted attempts at cultivation thus far, and while they will come up in the same spot year after year, the amount varies from year to year, and the habitat is very sensitive to disturbance. All this means that chanterelles are not a common find, and very expensive commercially. So if you happen to find a chanterelle harvesting ground, please treat it with respect so that they can continue to be harvested in years to come! I found them in a dark, thick conifer forest that was fairly wet and near a marshy area. There were probably 100 or so chanterelles spread out over an area about 30 feet wide, quite a great find. We collected about 1/3 of them and got out of the area quickly, so hopefully next year we will get another excellent crop. There are a couple potentially confusing look-alikes, so be VERY careful if you are not confident about your harvesting skills. Read about the False Chanterelle and Jack-O-Lantern mushrooms (which glow in the dark!) and make sure you know what you are doing. 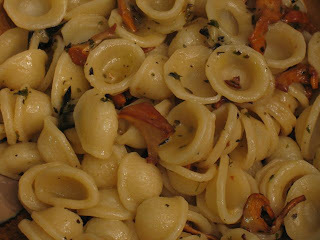 We made up the pasta below with our chanterelles, black trumpets (to be written about soon! ), and our own garlic. Super simple, and incredibly tasty- you can't beat fresh quality ingredients!